Detoxification at Coral Medical Health Spa is offered using the Metagenics Ultraclear Detoxification for the GI tract, Kidneys and liver. Metagenics Ultraclear Detox Program is designed for serious detox. This is achieved through a strict supplement protocol and specific dietary requirements. 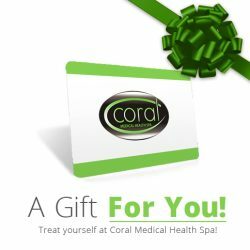 Each client works closely with Coral’s Nurse Practitioner to identify the safest and most effective program for their individual needs. In addition clients on the Metagenics Ultraclear program are required to meet with the nurse practitioner on a semi-regular basis to ensure continued progress and safety. Please click here to learn more. Detoxification occurs in three sequential steps — Phase I, Phase II & Phase III. Each of these phases involves reactions mediated by a number of different detoxifying enzymes. Phase I reactions generate many reactive intermediate metabolites as well as reactive oxygen species that are potentially damaging. Phase II reactions convert these reactive intermediate metabolites into water-soluble, non-harmful products that are eliminated from the body in Phase III. To get started on a detoxification age prevention program offered at Coral please contact guest services to schedule you initial consultation.